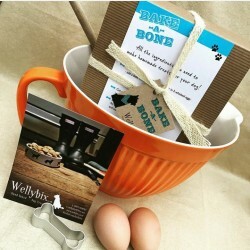 After giving up her job as a pastry chef, initially to become a carer for her mother, Alison decided to bake some biscuits for her Jack Russell, Welly. 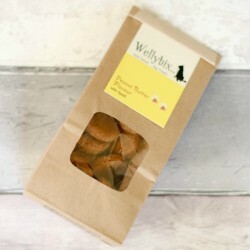 It wasn’t long before she began supplying the local hotel and holiday cottages with biscuits to give to clients who brought their pets on holiday. 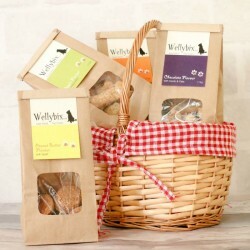 Wellybix products are full of natural goodness, packed with Alison's own garden herbs, and slow-baked for extra crunch. They are made with top quality human grade ingredients and have been analytically tested and approved by a veterinary laboratory. Wellybix have no artificial preservatives, colours, flavour enhancers or added sugar or salt and have also been tested and approved by Welly! In 2016, Wellybix were a Teesdale Business Awards finalist for 'Most Innovative Business" and "Sustainable Business of the Year".